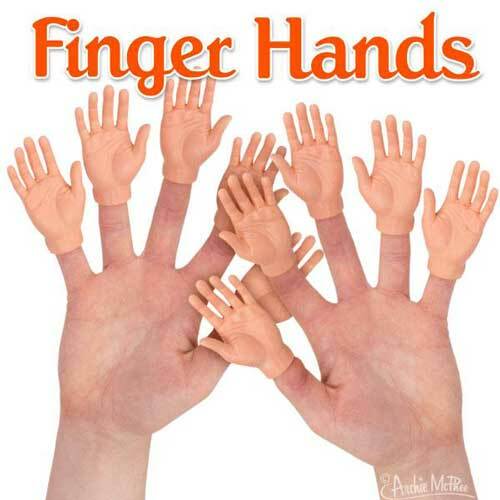 Well, three puppets that each use all five fingers. 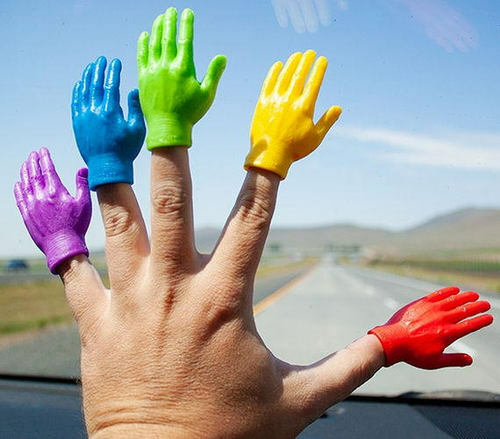 OK, four fingers and a thumb. 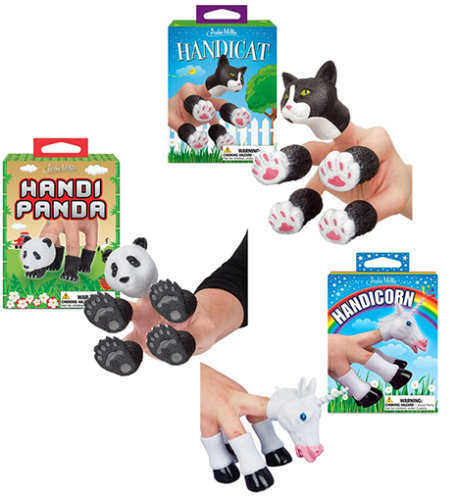 Stick a rubber foot on three fingers and a thumb, then pop the head onto your middle finger, and you’re a walking, talking panda, tabby cat or unicorn. You pick. And you do the talking, of course. Bound to amuse the kiddles, and probably give you hand-cramps, but who ever said puppetry was painless? They could be finger puppets, but they could be hands in search of a mini manikin. 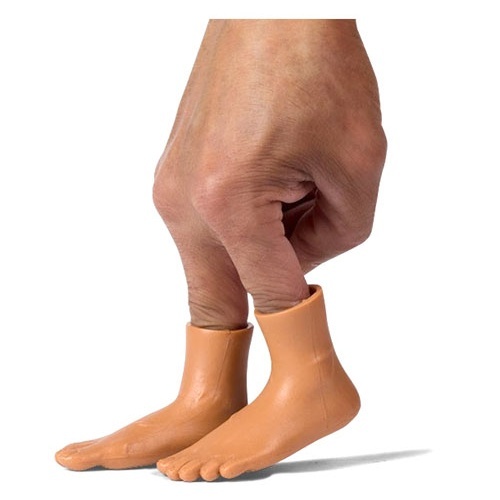 Wherever they came from, they're 2-5/8" long in flexible pink rubber, and remarkably life-like in a ready-to-shake pose. You'll get (5) total: (2) right; (2) left: and one of one or the other. Some of us think they'd be an interior decorating breakthrough if you lined up (15) or (20) of them on the mantel. 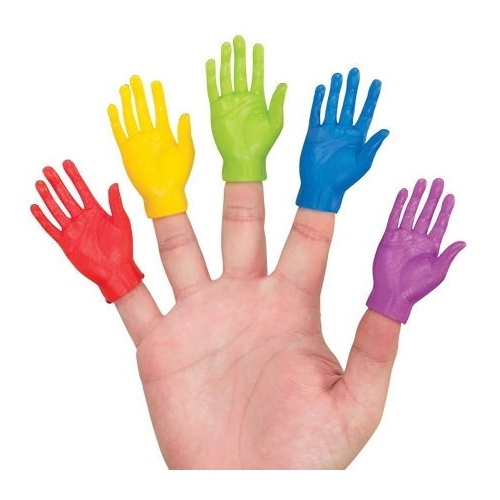 Just stick these 2-3/4" long rubber feet on your fingers and patter away. They’re puppet feet that have lost their puppets, and are super-accurate, with toenails, ankle bones and that little vein on the arch. You get (2) right and (2) left feet. Would make lovely gifts in bulk for the podiatrist in the family, or for folks who just, you know, like feet. A classic returns! 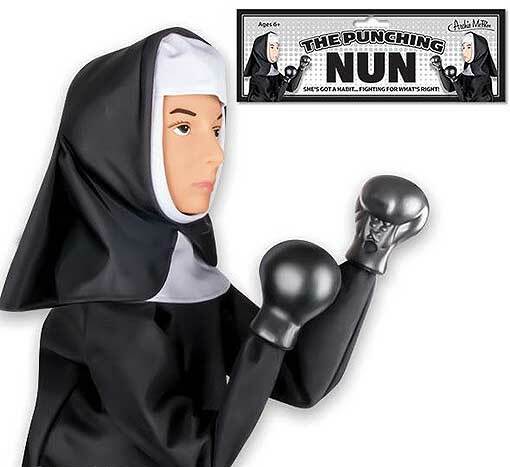 Our extra-large punching-nun puppet features a pair of thumb controls that activate very impressive jabs from both sides. A Nun’s Story meets Raging Bull. She’s wearing pretty much the same habit that Audrey Hepburn sported in the aforementioned movie. Ladies and gentlemen...wearing black and white, standing 12” tall with an 8-1/2” reach, weighing in at 1/2-lb… the Super-Flyweight Ecclesiastical Champion of the World, from Niles, Illinois...Sister Mary Punchyerlightsout…. What’s the difference between a duck? One of its legs are both the same. 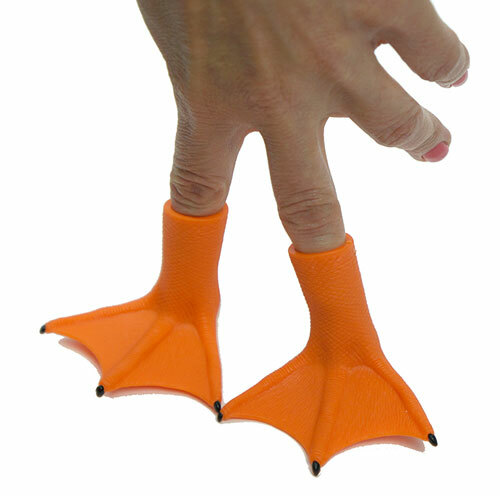 That’s our favorite old joke here at the home office, and now you can prove it by having your very own super-authentic rubber duck feet to compare. In very duckish orange, they’re approx 3” across x 2” tall. You’ll get (4) and all you add is a couple of mallards. 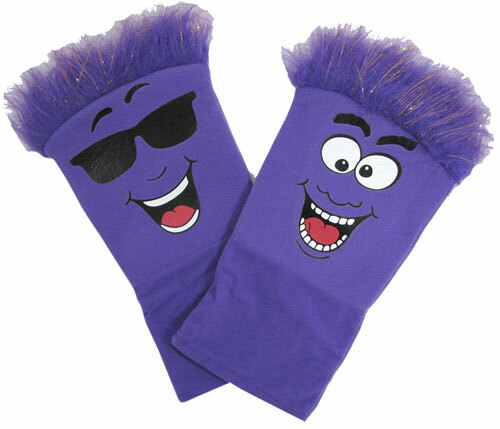 These are either polyester-haired wacky puppets or the world's least attractive mittens. Either way, they'll entertain your kids. Measure 11" tall (long?) x 6-1/4" so they'll take any size fist. You'll get (3) in red, purple, green or orange (our choice), and some might even have sunglasses.